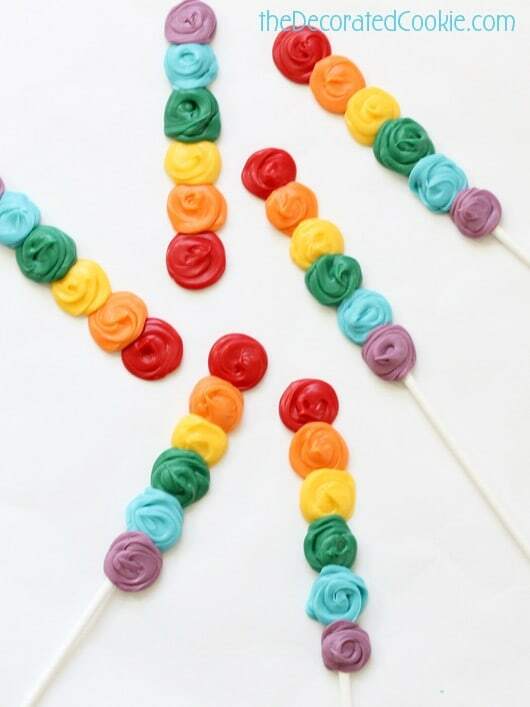 RAINBOW CANDY POPS -- Fun, colorful chocolate pops. 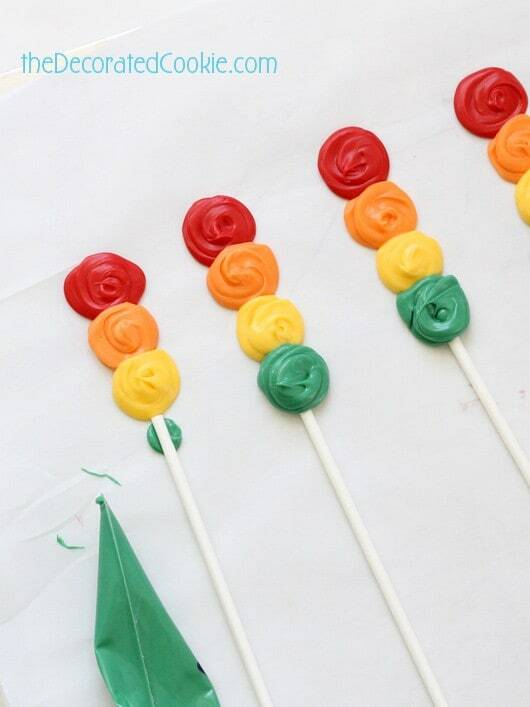 How to make easy rainbow candy pops. You know how much I love the candy melt pop thing. And of course I love rainbows (inspired particularly by my unicorn-rainbow-loving 7 year old and by the fact I’m an ’80s kid). 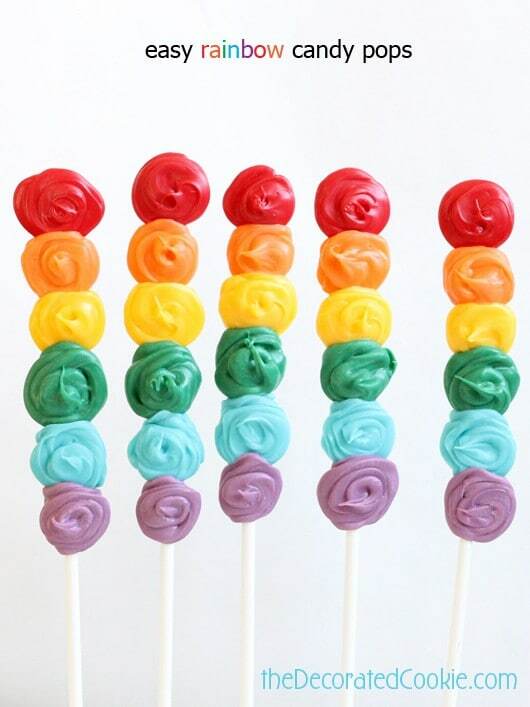 So candy melt pops + rainbows = awesome, in my view. And my daughter’s. And anyone with a heart. 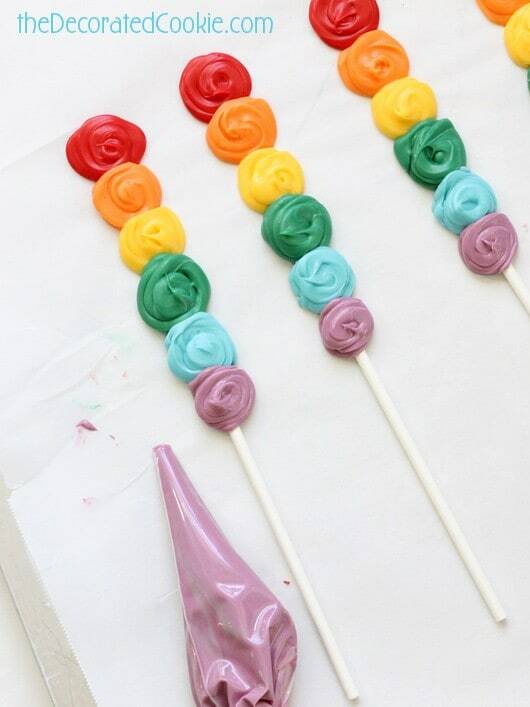 Rainbow candy pops, rainbow chocolate pops, whatever you call them, they are unicorn-friendly. 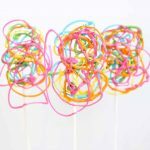 So you can make these on a rainy day. 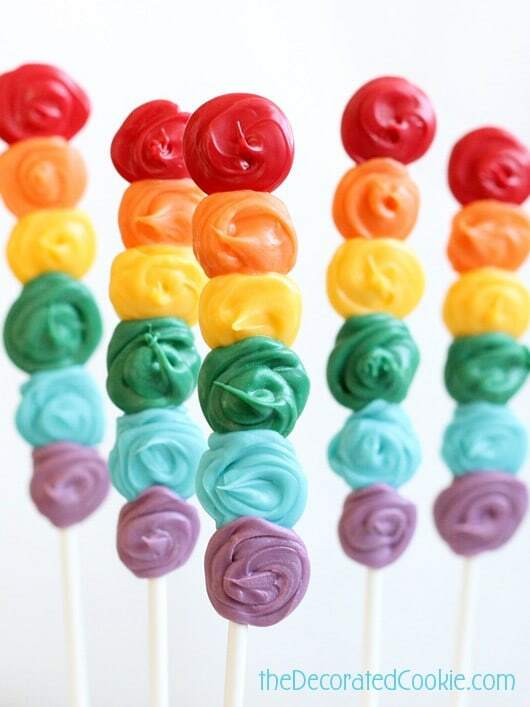 Or make them for a rainbow party. Or, you know… St. Patrick’s Day is coming up. Rainbows go with pots of gold. If you search for “rainbow” on my blog, you’ll find a lot of unicorn food. 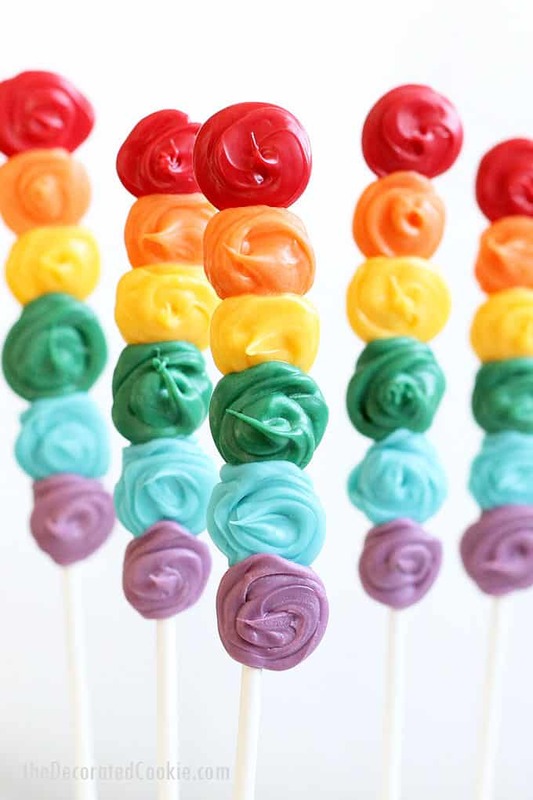 I especially love these rainbow swirl cupcakes, rainbow s’mores dip, and rainbow meringues. Need more? 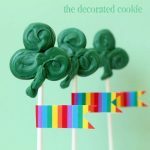 Here is a roundup of 40 rainbow food crafts. 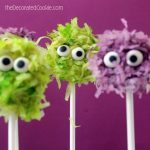 *Find decorating bags, candy melts and lollipop sticks in the craft store, or check out the links below. You can also click HERE to find more information about supplies. Line a baking tray (or trays) with parchment or wax paper. 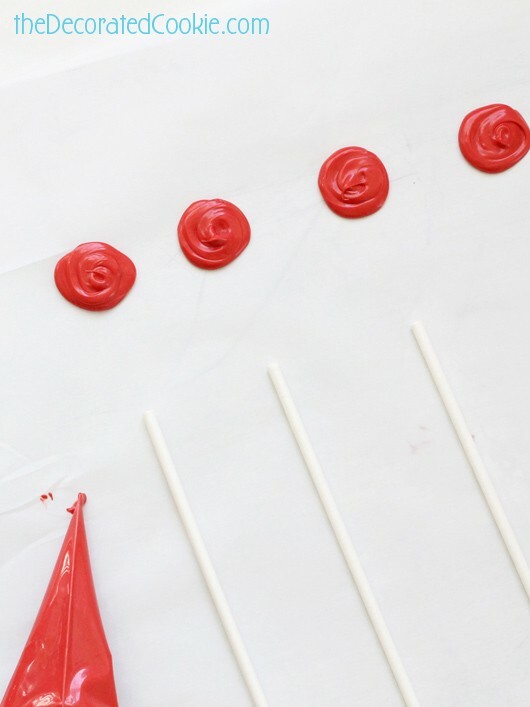 Place lollipop sticks in a row on the tray and set aside. 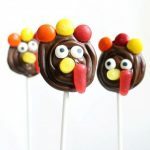 Fill six disposable decorating bags, each with about 1/2 cup of candy melts in red, orange, yellow, green, blue and purple. 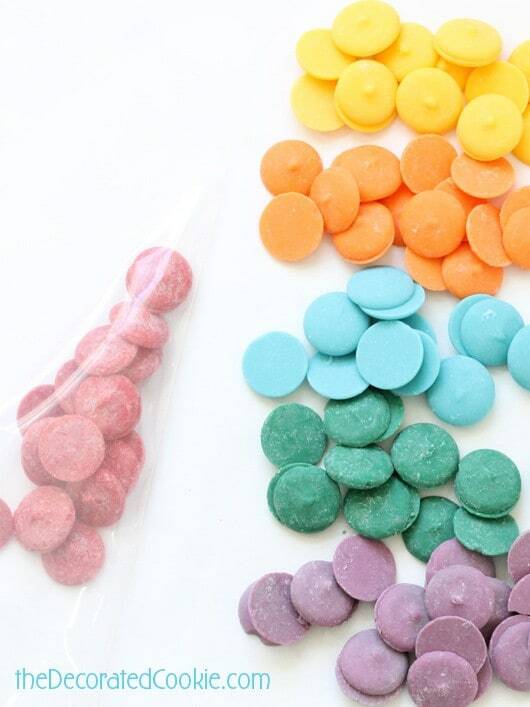 Add a few more candy melts to the green, blue and purple bags, because these dots are on top of the sticks and a little bigger. Start with red. Place the bag of red candy melts on a paper towel in the microwave and microwave at 70 percent power for 90 seconds. Massage the bag and continue to microwave at 30, then 15, second intervals until fully melted. Snip 1/4-inch from the tip of the bag. Pipe red dots (or squares or whatever) on the tray a couple inches above each lollipop stick. Repeat with the orange, piping the dot just below the red dot and overlapping slightly so they are attached. Only microwave one bag of candy melts at a time, since they harden quickly. Continue with the yellow. And then the green. At this point you should be hitting the stick. Pipe a dab of green candy melts under the stick so it stays in place, then pipe a dot on top of the stick. Continue with the blue and purple candy melts. Let the pops harden for about 30 minutes. When fully set, carefully remove from the tray.